Would you like to learn either the Hammer or Javelin throws? Next week you will have the opportunity to learn these awesome throwing events. 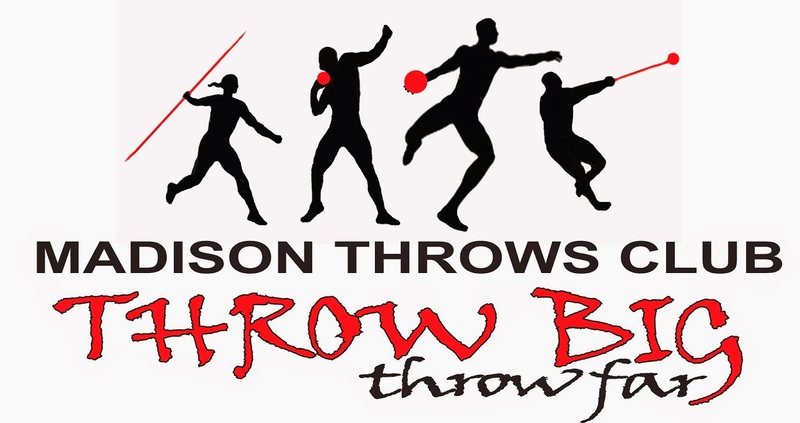 The cost is $20 for Madison Throws Club members or $30 for non-members. Please email me to reserve your spot (8 athlete max). As of NOON -Wednesday, June 18th. The crazy weather has seemingly moved east of Madison. While we still may see some rain, the severe weather should be over. We will have our 3pm and 4:30pm sessions as scheduled. It was another amazing weekend for Madison Throws Club throwers at the Wisconsin State Track and Field Championships. 27 Qualifiers won 4 State Championships, 2 Runner Ups, and 15 top 8 finishes. All of your hard work and dedication is truly amazing! Kiley Sabin (sr.) Slinger, repeated as the WIAA State D1 Girls Shot Put Champion. Samantha Noennig (so.) Hartford, won the 2014 WIAA D1 Girls Discus 148'11". Tucker Wedig (jr.) Belmont, won the 2014 WIAA D3 Boys Discus 169'05" and the Shot Put 57'5" Congratulations throwers! Jill Pedretti set the WIAA State Girls Discus Record at the 1999 State Meet. Special thanks to Joff and the Pedretti Family for sharing the video with me so I could share it and hopefully inspire future throwers in the State of Wiscosin!